Theodor Paues is a Swedish amateur photographer, based in Stockholm. Until June this year, he had no prior experience in landscape photography. 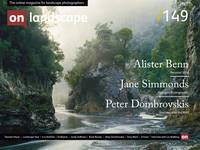 The Landscape Year is his first major photographic project. When not shooting, he runs a public affairs consultancy. He’s married with two children. How did this happen? I don’t even like being outdoors. Even as a child I thought of nature as a cold, wet and horrible place, and something to avoid at any cost. I have never owned any Gore-Tex clothes, never slept in a tent. But in May this year I made my decision – this year will be my landscape year. In the cause of 365 days I will go from having zero experience in this field, to becoming a really good landscape photographer. All free time I can spare will be spent in the field, and when the year is over I will host and exhibition of my work. It was Iceland that set me up do it. Last fall, a person I knew was organising a week-long photo trip there and in a spur of the moment decision, I booked myself on the trip. And there, walking in the lava fields and by the waterfalls, something happened. Yes, nature was cold and wet, and the wind and hail was whipping my face. But it was also magical. Wild, grand and dramatic. And capture it in a shot was something truly special. Extreme amounts of training, and getting personalised coaching. Inspiration or talent is not very important, transpiration is everything. So I wanted to design my landscape year in the same way, as the training program of an elite sportsman, or a top violin player. But with a camera. I am 43 years old, living in Stockholm, Sweden, with a wife and two kids and a demanding day-job. Time is short to begin with. So I realised this would only happen if would follow a routine, and I decided to set of time twice a week for shoots in the field. Every week, for a year. Yes, I do have a very understanding wife. And after some research I found Swedish landscape photographer Patrik Larsson, who accepted my offer to be my tutor and merciless drill instructor. My instruction to him was: put together a program for me that is the landscape photographer’s equivalent of military obstacle course training. Where I have to master all kinds of crawl, jump and runs and be forced to do a hundred push-ups every time I fail. Now Patrik is the kindest person you can imagine, so the push-ups didn’t happen. But basically my routine has been the same. Patrik gives me an assignment, I get out in the field and shoot, he evaluates my work and points out my mistakes, and I get out again and try better, harder. One more go on the obstacle course, again and again. But instead of walls to climb and trenches to crawl, its mountains and rivers and fields, to shoot and capture. One more go on the obstacle course, again and again. But instead of walls to climb and trenches to crawl, its mountains and rivers and fields, to shoot and capture. We have broken down the photography into its individual technical components, working with only one at a time. In the first few weeks I worked only with depth of field. I took really boring shots of trees on at f/11 aperture with different focal lengths and distance to the foreground. Just to learn how to get a super sharp image from foreground to background. Now I can do that. After that I worked only with lines that run the composition. Horizontal lines (sea views, meadows). Vertical lines (lots of trees). Diagonals (beach edges, mountains and rocks). Then only foregrounds, to get clear starting point in the picture and a sense of depth. More recently, it’s been light. First shooting only with sideways light, then light of particular quality, then another kind of light. Training each individual skill and component on its own, to optimize my improvement. Often I am out in the evenings or early mornings. Partly because the light is the best then, as all landscape photographers know. But also because it fits into my life, it’s the time slots after putting the kids to bed and before I get to the office for work. I tick off the nature reserves in Stockholm, one by one. It is not Iceland here at home, there are few waterfalls and steep cliffs. But the greater Stockholm area has a lot of accessible nature. Much more so than I had ever thought of before I started this project – great forests, streams, costal landscapes and an archipelago of many island. Literally, a new world opened up, a part of my surroundings I had never really taken notice of or cared about. And what constantly strikes me is how often I am alone in it. It might have to do with me being out there at 4 am… But anyway, shooting in Sweden is often the luxurious experience of shooting undisturbed. Recently I photographed the sunrise at Spirudden, a small peninsula part of Tyresta National Park. I stepped into the car at home and drove into the darkness, turning off from the main road from the city after a while and into the agricultural landscapes where few cars passed. There was fog in the fields, and odd deer were looking at me as I passed. When I came to the peninsula at the end of my drive, it was just me, old knotty oak trees and a magical morning light that burned the fog away.On my way home, I saw two moose, just 20 meters from me. It was an ordinary morning, half an hour from Stockholm city centre. On my way home, I saw two moose, just 20 meters from me. It was an ordinary morning, half an hour from Stockholm city centre. Taking on photography as a specific set of tasks that I address in deep detail – going full nerd, if you will – has made shooting more fun. When I started shooting six years ago, I had no direction; I took pictures of everything – family and friends, urban environments, travel photos, macro. Now I only shoot landscapes – no people, no animals, no buildings. Only nature. And I do it following according a strict program. You might think that would be monotonous and dull, but it’s the opposite. It’s a real commitment. Going into a project like this is to fully engage, and to let the project truly be a part of me. Having a clear structure is also what made it practically possible pull off. If I would allow myself to consider in the evening if it’s a good idea to put the alarm clock at 3 am, then the answer would very likely be no. But I don’t allow myself to consider that option. I have ordered myself to shoot twice a week and then it just has to be done, I just do it. Come work weeks, come holidays. Twice a week I get up and out, and shoot. It’s not always great, or even good or fun. But suddenly I find myself standing there with my tripod in a field somewhere at that perfect moment just before the sun rises, capturing something amazing with skills I have honed through all that traing. And it all just pays off. Many people think of photography as an artistic activity, which it of cause is. But I’ve chosen to focus more on discipline, technical perfection and developing specific skills. It is that discipline that releases my creativity. And I often think of the musician Nick Cave – who goes to an office every morning and composes all day his piano, alone. The creative as a disciplined work. I will not compare myself to him in any other way, but our working methods are the same. Hard training, week after week. I am now about six months into my landscape year. Six more months of running the obstacle course. Six more months in the cold and wet nature. It will be great. Follow my year in my Facebook group or Instagram, where I blog about my visits to the field. And, of course, if are in Stockholm in June next year, you are very welcome to the end-of-year exhibition!